Metrical Psalms were favoured by followers of Jean Calvin, mainly because they were vernacular versions of Biblical texts, and so were close to the originals. In England, they were favoured by the reformed Church of England, and provided the chief form of congregational song from the time of the English Reformation (c. 1547) until the eighteenth century. Thomas Sternhold (d.1549) began writing metrical versions of the psalms towards the end of his life. After his death, John Hopkins continued compiling a complete set of metrical psalms. 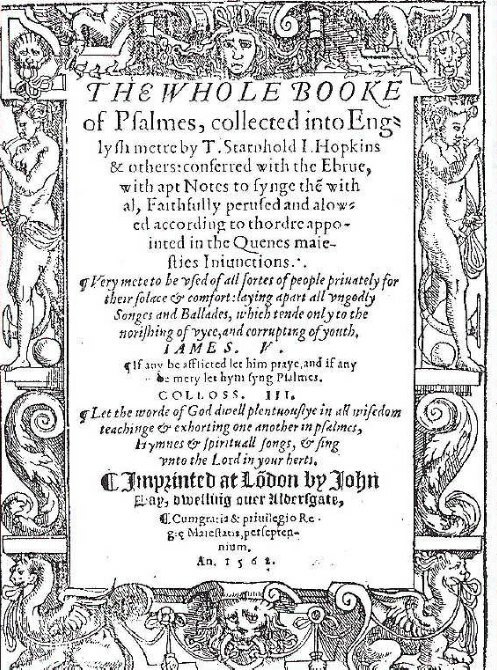 The work of both writers was published in 1562 under the title The whole Booke of Psalmes, collected into Englysh metre by T. Starnhold I. Hopkins & others. It became known as ‘Sternhold and Hopkins’ and also the ‘Old Version’ and was in use for over 150 years. The words and tune for the hymn ‘All people that on earth do dwell’ (also known as the ‘Old Hundredth’ because it is based on Psalm 100) comes from Sternhold and Hopkins. This hymn is still in use and was arranged into an expanded version by Ralph Vaughan Williams for the Coronation of Elizabeth II in 1953.